Sandals Resorts International has officially started construction on its newest resort in Saint Lucia. When this new luxury resort is finished, it will be the fourth Sandals property on the island – an unparalleled investment by Sandals in Saint Lucia. 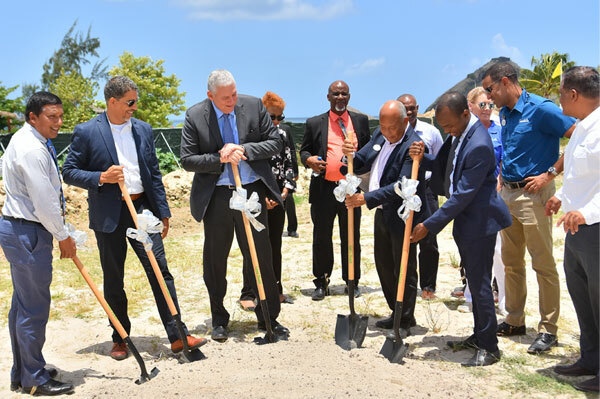 The groundbreaking ceremony was officiated by Allen Chastanet, prime minister of Saint Lucia on May 2. He was joined by other notable government attendees including Minister with Responsibility for Tourism Dominic Fedee and Minister of Economic Development and Urban Renewal Guy Joseph, as well as Sandals Resorts International representatives Jeremy Jones, director of Corporate Services and Winston Anderson, managing director, Sandals Saint Lucia. The construction of the fourth Saint Lucia Sandals resort will employ more than 1,200 local citizens, with an estimated construction time between 22 and 24 months. Upon completion the new Sandals resort will boast 380 high-end suites, the very latest in room designs and features, and will employ an additional 900 permanent workers – bringing the total number of employees in Saint Lucia to 2,700. Other Sandals resorts in Saint Lucia include Sandals Regency La Toc – currently celebrating its 25th anniversary – Sandals Grande St. Lucian and Sandals Halcyon Beach. Pictured, Allan Chastanet, prime minister of Saint Lucia (centre with shovel) joins government colleagues and Sandals Resorts International officials as they turn over the first sod of Sandals’ fourth resort on the island.